To be frank, I was not a person who keeps on downloading movies, software and videos but recently I got an addiction of downloading movies and tutorials videos. In the early days, I preferred to get the tutorial videos from my friends or try to download videos myself sometimes when it gets very urgent. But now as I started to watch movies in my laptop, I need to download few movies every week. Direct downloading doesnât give much speed and also if sometimes internet stops working then resuming the download is not possible at times and also managing all the downloaded files becomes tough. In such case, using download managers is a great idea as this kind of software increases the speed of download, manage all of your downloads, and resuming is possible all the time. It is extremely beneficial for them who have slow internet as they can download files when they donât need bandwidth for other work and pause the download when they need the bandwidth for some other tasks. In this way, they can download files/movies/videos efficiently without hurting other tasks. But when you are downloading directly from browser, all or most bandwidth can go in download thus you cannot have smooth surfing. Â Therefore, using a download manager is recommended if you download frequently. I am a windows user, so I have compiled a list of 5 best and free download managers which worked quite well for me. However, I am not using all currently rather I use Free Download Manager about which you will read below. As the name says, itâs a completely free download manager and download accelerator. Simultaneous Downloading from multiple Mirrors. It helps you download only the selected parts of a zip file. It offers HTML spider which enables you to download a whole website. Adjusts traffic usage for surfing and simultaneous downloads. Resuming broken downloads is one of the best features being offered by FDM. You can create a portable version of this software and use it on multiple computers without installing it on every computer. It downloads files using BitTorrent Protocol which is for the Peer to Peer file sharing of data across internet. It is one of the most famous download managers among all. It increases the speed of download up to 5 times. You can schedule and resume downloads as per your requirement. It offers both Free and Premium plans. Download Accelerator is available to accelerate the speed of download by 5x. It checks for viruses and malware before downloading the files from internet. Download resume facility is available. It has advanced browser integration facility which most of other download managers donât offer. Enabling this can allow you catch any download from any application. You can set download limits. It is multilingual and supports an extensive range of languages. It supports many proxy servers. It can download a complete website or a web page or elements of web pages. Video Grabber is there to download videos from any webpage or any video streaming sites. 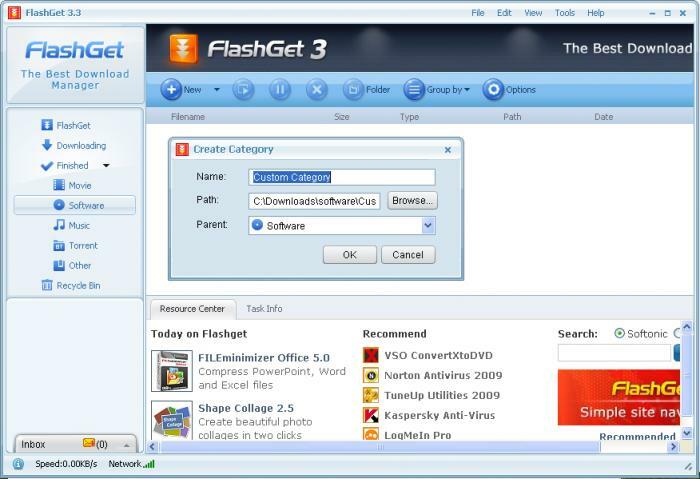 When we are talking about the best download managers then how can we miss FlashGet Download Manager. This supports HTTP, FTP, BT and eMule and few other protocols for downloading files from Internet. It increases download speed by 6-10x. It uses very low system resource. Checks the files for viruses, spyware, and adware. Another good name in the list DAP. T….